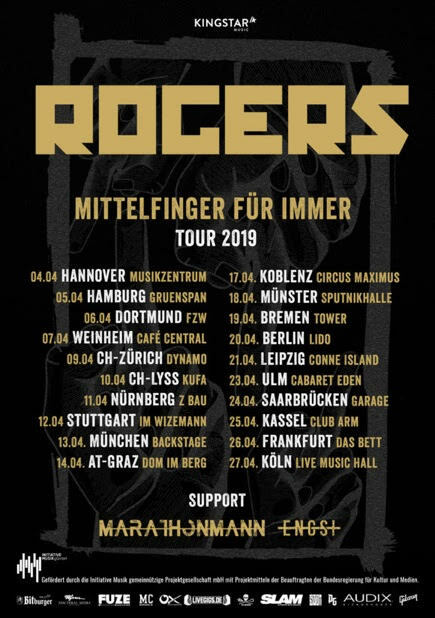 ROGERS have spent their time at innumerable festivals this summer, as well as support for Bad Religion, Madsen and Die Toten Hosen, the Dusseldorfers are happy to announce their headliner tour for Spring 2019. The troop of the Rhine, which has meanwhile become the spearhead of German punk rock, will visit no less than 20 cities across Germany, Austria and Switzerland. A new studio album is also planned for spring, more information will follow soon. The band commented on the tour: "We're already looking forward to seeing what the clubs will look like after we broke up with our friends from Marathonmann and Engst! For a month, almost every night with our friends disassemble the clubs in Germany, Austria and Switzerland? - Of course we are there! We can hardly wait!"